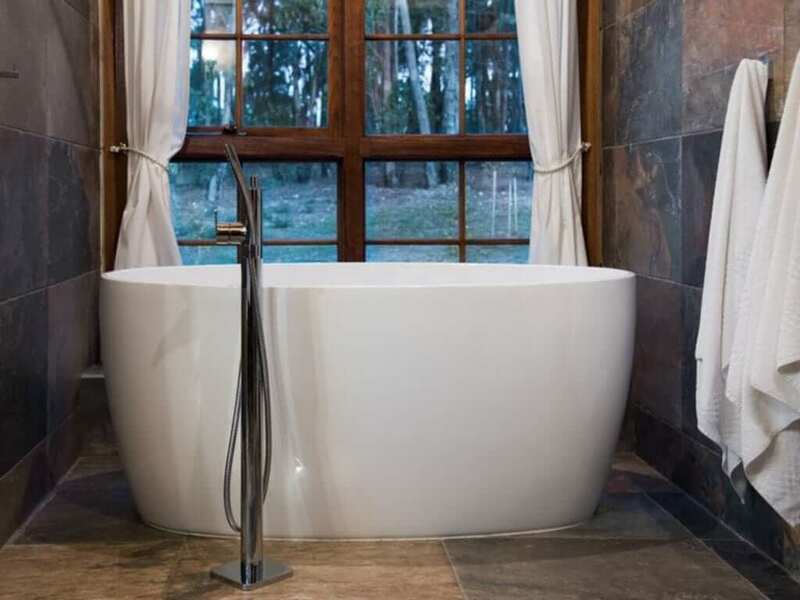 Cedar & Stone is a gorgeous property, located just outside Daylesford, set on 5 acres of park and woodland. 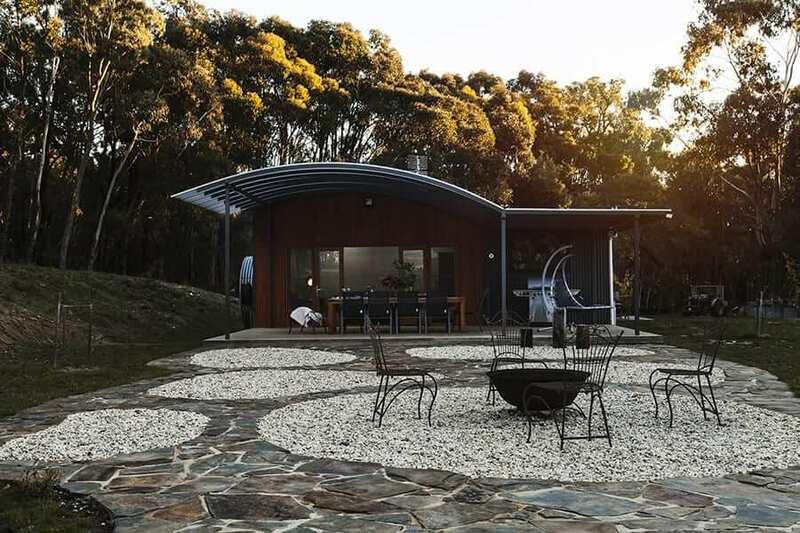 The complex offers two stylish separate houses and includes a sauna, an entertainment area, sleeping for 14 people, a lake and and plenty of space for groups. Impressive ranch-style property on 5 acres of parkland with quarters spread across two elegant houses. 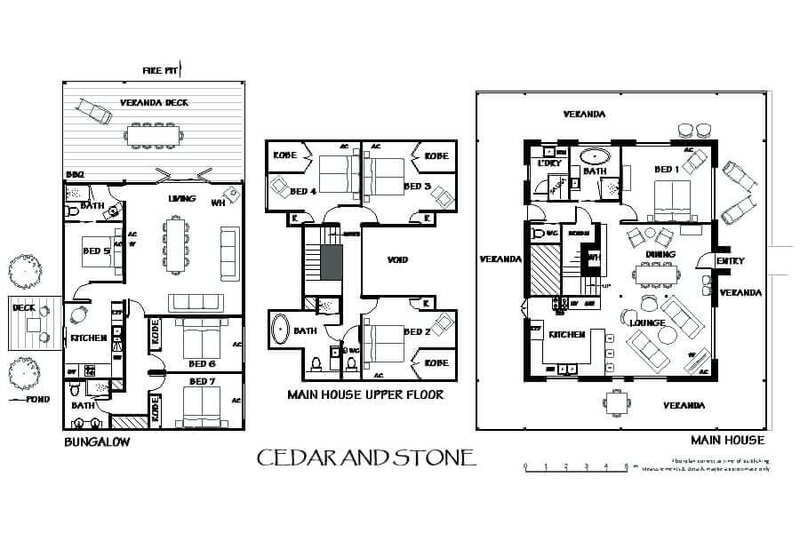 Between the main house and the studio, Cedar and Stone can comfortably fit up to 14 guests, offering both entertainment and privacy. 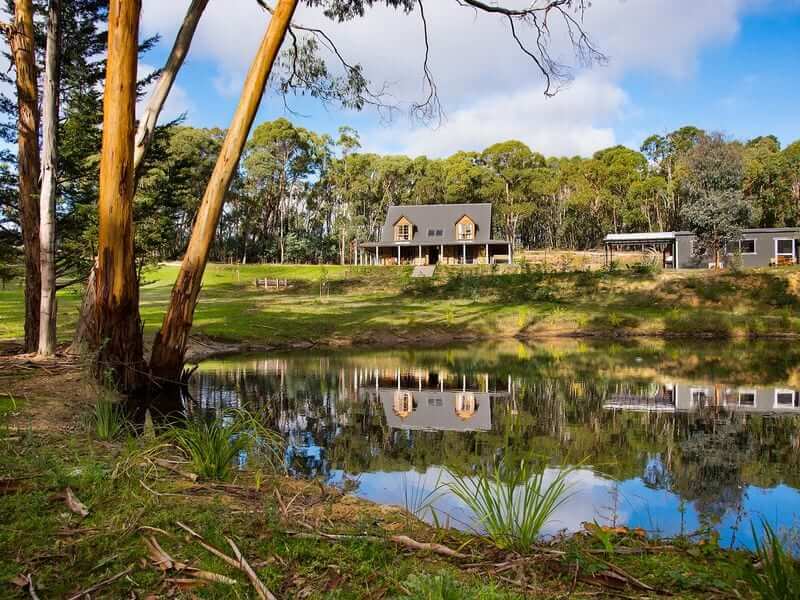 Far from the overwhelming presence of the city, this idyllic property makes for a great group getaway while retaining a convenient proximity to the town of Daylesford. The main building, and the larger of the two, boasts 4 bedrooms, three of which reside on the upper floor. On the bottom floor, a substantial entertainer’s kitchen will allow you to cook for the whole group. 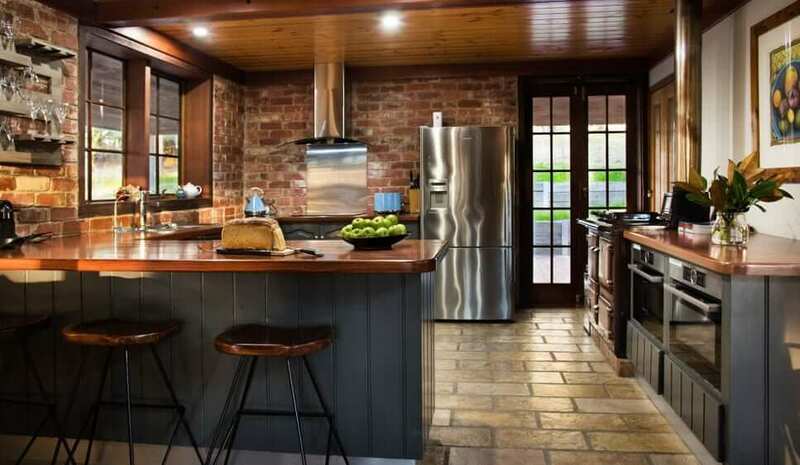 A rustic brick wall completes the room, which contains 2 microwaves, 2 large ovens, a dishwasher and a stove as well as bar seating and other basic amenities. Enjoy cooking, snacking and hanging out in this beautiful kitchen area, or head into the adjoining open-plan living and dining area for something more formal. With a dining table that seats 10, a combustion wood fire and the lounge just a few steps away, this fashionably decorated dining area is perfect for relaxing and spending time together. 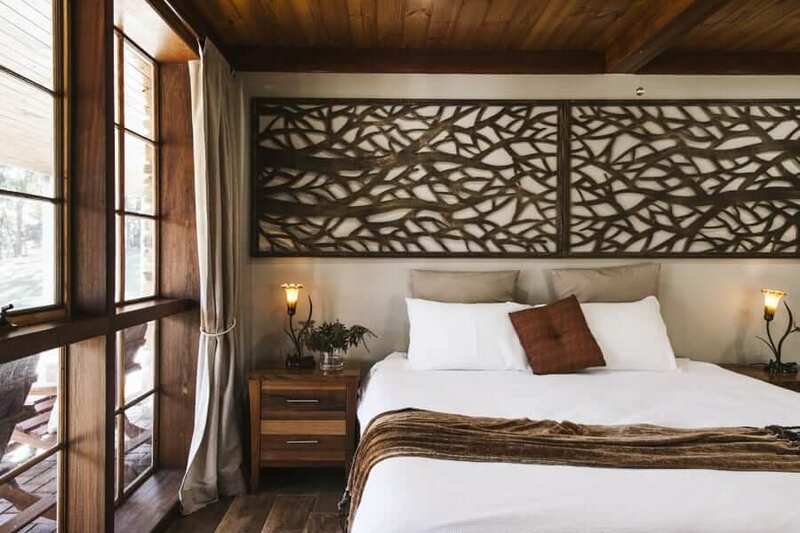 Rich wood ceilings, furniture and wall decorations in the bedrooms and common areas come together with the stone and tiles of the bathrooms and kitchen to create an elegant yet homey atmosphere in the main house. 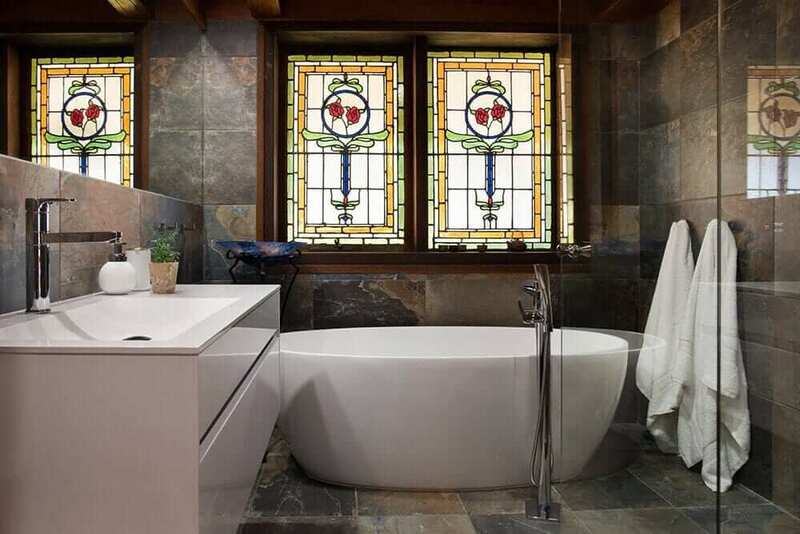 Find spectacular stained glass artwork as well as regular windows in the bathrooms, providing plenty of natural light. Don’t forget to spend some time in the infrared sauna! 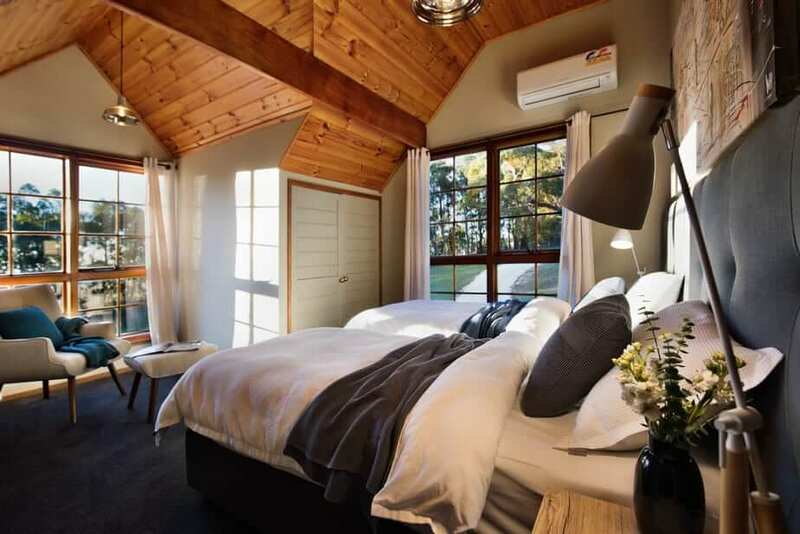 The bedrooms are again infused with natural light and offer soft bedding, making them ideal places for enjoying a view of the property during the day, or getting some rest under the moonlight. The smaller studio, not 50 meters from the main house, offers a slightly darker, more modern indoor aesthetic. This smaller building also boasts bedrooms, bathrooms and a kitchen. 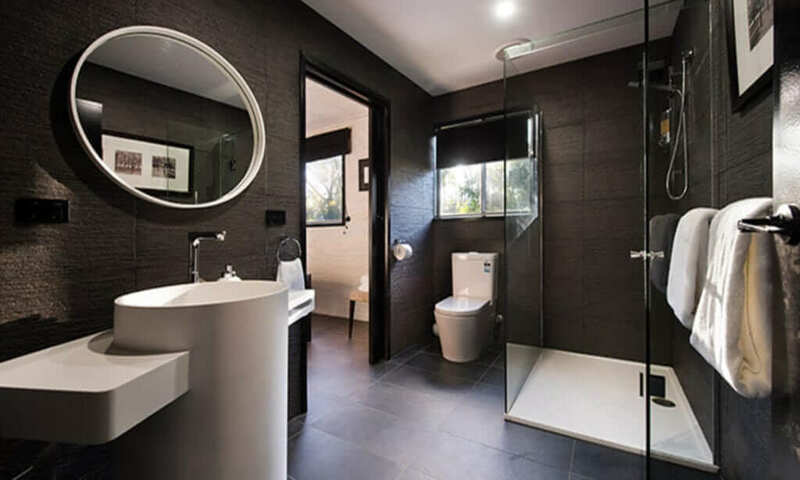 Sleek, dark walls in the bedrooms and bathrooms match the cabinets and cupboards in the kitchen. Split system cooling and heating will allow you to perfectly regulate temperatures inside both of the buildings to fit any time of year. 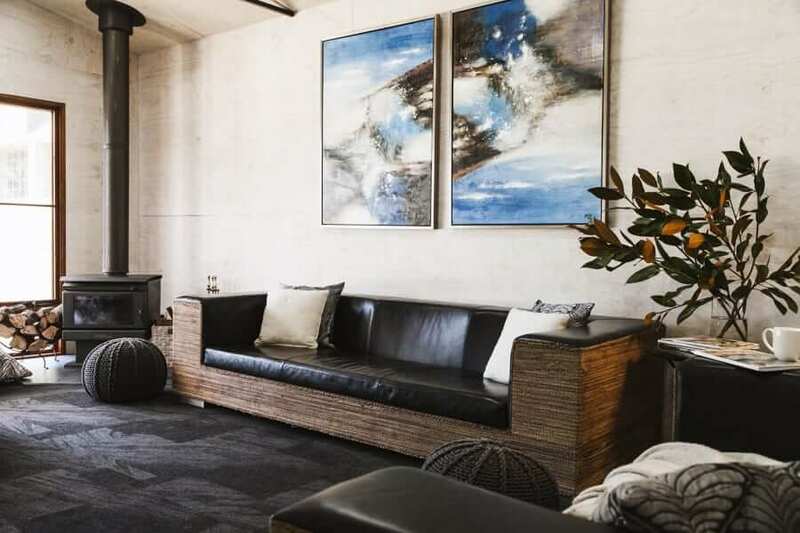 Just outside the studio, under an elegant, arcing verandah is an outdoor living and entertainment area with a large table, fire pit, barbeque and basketball hoop. This communal area is perfect for bringing the lodgers of both buildings outside together to eat, socialise and enjoy the private woodland encompassing them. 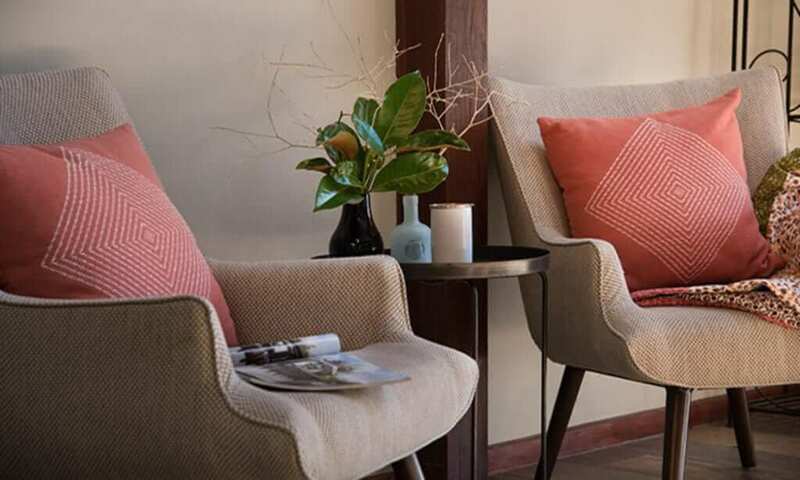 These unique lodgings, spread between two stylish houses, provide all the comfort, entertainment and privacy a group might need, whether it be a holiday or a corporate function. 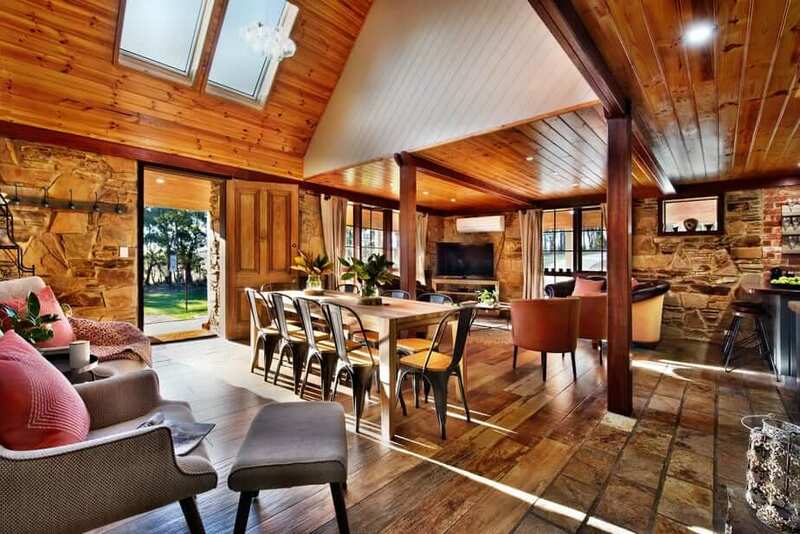 Cedar and Stone offers an amazing experience of the Victorian countryside while still only being located an 8 minute drive from the centre of Daylesford. Before you take advantage of the sauna, entertainment room or anything else indoors, be sure to enjoy the beautiful property surrounding these homes. More than just a taste of nature, the woodland around Cedar and Stone accommodates plenty of its own guests among the trees and grass – Australian wildlife of all kinds and, of course, kangaroos! The animals commonly pass through the property and around the dam, offering an experience quite unique to the Australian countryside. What a wonderful property! We had a group of friends (11) stay at Cedar and Stone to celebrate my husband's 45th birthday. 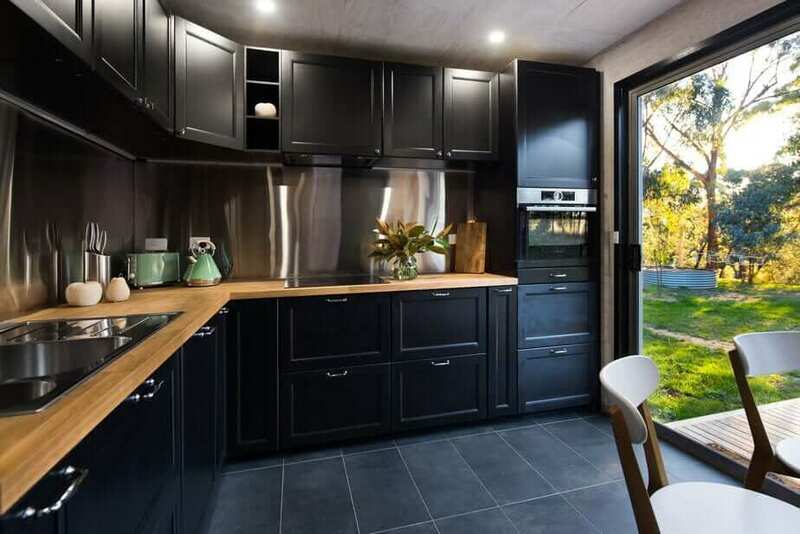 Kitchen facilities and appliances were perfect for our self-catering needs as food lovers. Everyone commented how comfortable the beds were and we loved the large cosy lounges and the wood fire. Recommendation : When 7 couples staying and sharing this wonderful accommodation, are organising individually what group of friends they could bring back to share such a fabulous stay, that says it all. All couples 100% satisfied. Cedar and Stone was perfect for our big family gathering. 5 acres of land and plenty of space inside with lots of activities and cozy fires in and outdoors. The bedrooms were lovely, the kitchen amazing. A fantastic family or group retreat. Highly recommended. 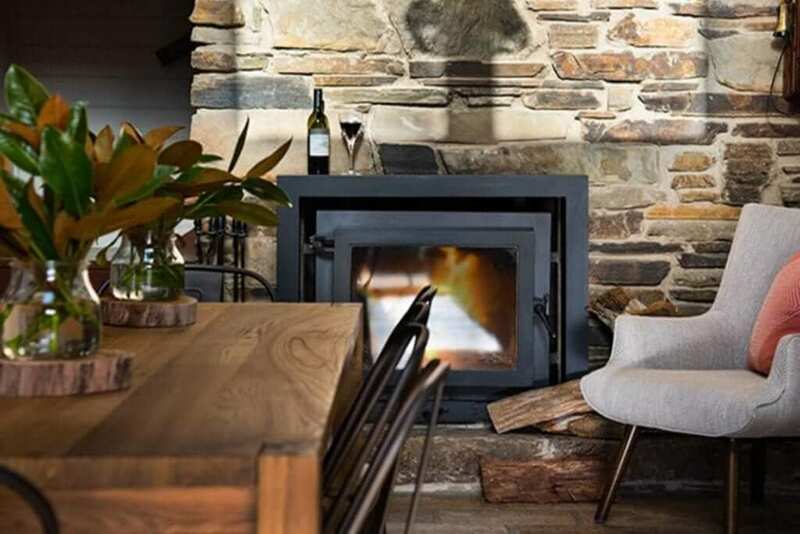 You may be interested in our other properties – See what The Lodge has to offer your next vacation, or check out the magnificent The Main Homestead, or browse our other luxury choices in Daylesford accommodation.